The spacecraft consisted of two platforms and six vertical panels, all made of aluminum honeycomb. The solar array consisted of three deployable sections, generating around 300 W in total. Two S-band antennas were located on the top and bottom of the spacecraft, providing an omni-directional downlink data rate of 24 kbit/s. An attitude and orbit-control subsystem (comprising 5 Newton hydrazine thrusters for course manoeuvres, 20 milli-Newton cold gas thrusters for attitude control, and gyroscopes for attitude determination) ensured correct dynamic attitude control and determination during the operational lifetime. The Hipparcos satellite was launched (with the direct broadcast satellite TV-SAT2 as co-passenger) on an Ariane 4 launch vehicle, flight V33, from Kourou, French Guiana, on 8 August 1989. Launched into a geostationary transfer orbit, the Mage-2 apogee boost motor failed to fire, and the intended geostationary orbit was never achieved. However, with the addition of further ground stations, in addition to the primary ground station at Odenwald in Germany, the satellite was successfully operated in its geostationary transfer orbit for almost 3.5 years. All of the original mission goals were, eventually, exceeded. The satellite was operated by the ESA operations control centre at ESOC, Darmstadt (Germany). The satellite observations relied on a pre-defined list of target stars. Stars were observed as the satellite rotated, by a sensitive region of the image dissector tube detector. This pre-defined star list formed the Hipparcos Input Catalogue: each star in the final Hipparcos Catalogue was contained in the Input Catalogue. The Input Catalogue was compiled by the INCA Consortium over the period 1982—89, finalised pre-launch, and published both digitally and in printed form. Although fully superseded by the satellite results, it nevertheless includes supplemental information on multiple system components as well as compilations of radial velocities and spectral types which, not observed by the satellite, were not included in the published Hipparcos Catalogue. The Hipparcos and Tycho Catalogues were then constructed such that the Hipparcos reference frame coincides, to within observational uncertainties, with the International Celestial Reference System (the ICRS), and representing the best estimates at the time of the catalogue completion (in 1996). The resulting Hipparcos reference frame is thus the materialisation of the ICRS in the optical. It extends and improves the J2000 (FK5) system, retaining approximately the global orientation of that system but without its regional errors. A measurement in 2014 using VLBI is reported to give a distance of 444 light-years (136.2) parsecs. 1 2 3 4 European Space Agency (June 1997). "The Hipparcos and Tycho Catalogues" (PDF). ESA. Retrieved 2014-06-16. 1 2 3 4 5 6 7 8 9 10 11 "HIPPARCOS Satellite details 1989-062B NORAD 20169". N2YO. 16 June 2015. Retrieved 16 June 2015. 1 2 Perryman, Michael (2010). Khanna, Ramon, ed. The Making of History's Greatest Star Map. Heidelberg: Springer-Verlag. doi:10.1007/978-3-642-11602-5. ISBN 9783642116018. ↑ Lacroute, P. (1967). "Proceedings of the 13th General Assembly". Transactions of the International Astronomical Union. XIIIB: 63. ↑ Turon, C.; et al. (1995). "Properties of the Hipparcos Input Catalogue". Astronomy & Astrophysics. 304: 82–93. Bibcode:1995A&A...304...82T. ↑ Kovalevsky, J.; et al. (1997). "The Hipparcos Catalogue as a Realisation of the Extragalactic Reference Frame". Astronomy & Astrophysics. 323: 620–633. Bibcode:1997A&A...323..620K. ↑ Perryman, M.A.C. ; et al. (1997). "The Hipparcos Catalogue". Astronomy & Astrophysics. 323: L49–L52. Bibcode:1997A&A...323L..49P. ↑ Lindegren, L.; et al. (1997). "Double star data in the Hipparcos Catalogue". Astronomy & Astrophysics. 323: L53–L56. Bibcode:1997A&A...323L..53L. ↑ Van Leeuwen, F.; et al. (1997). "The Hipparcos Mission: Photometric Data". Astronomy & Astrophysics. 323: L61–L64. Bibcode:1997A&A...323L..61V. ↑ Høg, E.; et al. (1997). "The Tycho Catalogue". Astronomy & Astrophysics. 323: L57–L60. Bibcode:1997A&A...323L..57H. ↑ European Space Agency (1997). The Hipparcos and Tycho Catalogues. Noordwijk, the Netherlands: ESA Publications Division. ISBN 92-9092-399-7. ↑ Høg, E.; et al. (2000). "The Tycho-2 Catalogue of the 2.5 million brightest stars". Astronomy & Astrophysics. 355: L27–L30. Bibcode:2000A&A...355L..27H. ↑ Sinnott, Roger; Perryman, Michael (1997). 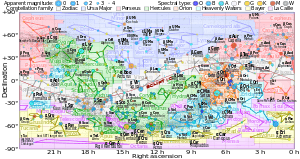 Millennium Star Atlas. Sky Publishing Corporation & European Space Agency. ISBN 0-933346-83-2. 1 2 Van Leeuwen, Floor (2007). Hipparcos, the New Reduction of the Raw Data. Springer, Dordrecht. ISBN 1-4020-6341-5. ↑ Perryman, Michael (2009). Astronomical Applications of Astrometry: Ten Years of Exploitation of the Hipparcos Satellite Data. Cambridge University Press. p. 692. ISBN 978-0-521-51489-7. ↑ Feast, M.W. ; Whitelock, P.A. (1997). "Galactic kinematics of Cepheids from Hipparcos proper motions". Monthly Notices of the Royal Astronomical Society. 291: 683–693. arXiv:astro-ph/9706293 . Bibcode:1997MNRAS.291..683F. doi:10.1093/mnras/291.4.683. ↑ Høg, E.; Petersen, J.O. (1997). "Hipparcos parallaxes and the nature of delta Scuti stars". Astronomy & Astrophysics. 323: 827–830. Bibcode:1997A&A...323..827H. ↑ Dehnen, W.; Binney, J.J. (1998). "Local stellar kinematics from Hipparcos data". Monthly Notices of the Royal Astronomical Society. 298 (2): 387–394. arXiv:astro-ph/9710077 . Bibcode:1998MNRAS.298..387D. doi:10.1046/j.1365-8711.1998.01600.x. ↑ Provencal, J.L. ; et al. (1998). "Testing the white dwarf mass-radius relation with Hipparcos". Astrophysical Journal. 494 (2): 759–767. Bibcode:1998ApJ...494..759P. doi:10.1086/305238. ↑ Perryman, M.A.C. ; et al. (1998). "The Hyades: distance, structure, dynamics, and age". Astronomy & Astrophysics. 331: 81–120. arXiv:astro-ph/9707253 . Bibcode:1998A&A...331...81P. ↑ Moffat, A.F.J. ; et al. (1998). "Wolf-Rayet stars and O-star runaways with Hipparcos Kinematics". Astronomy & Astrophysics. 331: 949–958. Bibcode:1998A&A...331..949M. ↑ Reid, I.N. (1998). "Hipparcos subdwarf parallaxes: metal-rich clusters and the thick disk". Astronomical Journal. 115 (1): 204–228. Bibcode:1998AJ....115..204R. doi:10.1086/300167. ↑ Girardi, L.; et al. (1998). "Fine structure of the red giant clump from Hipparcos data, and distance determinations based on its mean magnitude". Monthly Notices of the Royal Astronomical Society. 301 (1): 149–160. arXiv:astro-ph/9805127 . Bibcode:1998MNRAS.301..149G. doi:10.1046/j.1365-8711.1998.02011.x. ↑ Smart, R.L. ; et al. (1998). "Unexpected stellar velocity distribution in the warped Galactic disk". Nature. 392 (6675): 471–473. Bibcode:1998Natur.392..471S. doi:10.1038/33096. ↑ Oudmaijer, Rene D.; Groenewegen, Martin A. T.; Schrijver, Hans. "The Lutz-Kelker bias in trigonometric parallaxes". Monthly Notices of the Royal Astronomical Society. 294: L41-L46. arXiv:astro-ph/9801093 . Bibcode:1998MNRAS.294L..41O. doi:10.1046/j.1365-8711.1998.01409.x. ↑ Olling, R.P. ; Merrifield, M.R.. (1998). "Refining the Oort and Galactic constants". Monthly Notices of the Royal Astronomical Society. 297 (3): 943–952. arXiv:astro-ph/9802034 . Bibcode:1998MNRAS.297..943O. doi:10.1046/j.1365-8711.1998.01577.x. ↑ Stothers, R.B. (1998). "Galactic disk dark matter, terrestrial impact cratering and the law of large numbers". Monthly Notices of the Royal Astronomical Society. 300 (4): 1098–1104. Bibcode:1998MNRAS.300.1098S. doi:10.1046/j.1365-8711.1998.02001.x. ↑ Comerón, F. (1999). "Vertical motion and expansion of the Gould Belt". Astronomy & Astrophysics. 351: 506–518. Bibcode:1999A&A...351..506C. ↑ Corbet, R.H.D. (1999). "The use of gamma-ray bursts as direction and time markers in SETI strategies". Publications of the Astronomical Society of the Pacific. 111 (761): 881–885. arXiv:astro-ph/9904268 . Bibcode:1999PASP..111..881C. doi:10.1086/316395. ↑ Helmi, A.; et al. (1999). 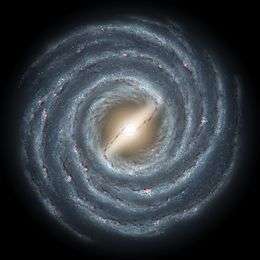 "Debris streams in the solar neighbourhood as relics from the formation of the Milky Way". Nature. 402 (6757): 53–55. arXiv:astro-ph/9911041 . Bibcode:1999Natur.402...53H. doi:10.1038/46980. ↑ de Zeeuw, P.T. ; et al. (1999). "A Hipparcos census of the nearby OB associations". Astronomical Journal. 117 (1): 354–399. arXiv:astro-ph/9809227 . Bibcode:1999AJ....117..354D. doi:10.1086/300682. ↑ Garcia Sanchez, J.; et al. (1999). "Stellar encounters with the Oort Cloud based on Hipparcos data". Astronomical Journal. 117 (2): 1042–1055. Bibcode:1999AJ....117.1042G. doi:10.1086/300723. ↑ Söderhjelm, S. (1999). "Visual binary orbits and masses post Hipparcos". Astronomy & Astrophysics. 341: 121–140. Bibcode:1999A&A...341..121S. ↑ Robichon, N.; Arenou, F. (2000). "HD209458 planetary transits from Hipparcos photometry". Astronomy & Astrophysics. 355: 295–298. Bibcode:2000A&A...355..295R. ↑ Chiba, M.; Beers, T.C. (2000). "Kinematics of metal-poor stars in the Galaxy. III. Formation of the stellar halo and thick disk as revealed from a large sample of non-kinematically selected stars". Astronomical Journal. 119 (6): 2843–2865. arXiv:astro-ph/0003087 . Bibcode:2000AJ....119.2843C. doi:10.1086/301409. ↑ Holmberg, J.; Flynn, C. (2000). "The local density of matter mapped by Hipparcos". Monthly Notices of the Royal Astronomical Society. 313 (2): 209–216. arXiv:astro-ph/9812404 . Bibcode:2000MNRAS.313..209H. doi:10.1046/j.1365-8711.2000.02905.x. ↑ Gies, D.R. ; Helsel, J.W. (2005). "Ice age epochs and the Sun's path through the Galaxy". Astrophysical Journal. 626 (2): 844–848. arXiv:astro-ph/0503306 . Bibcode:2005ApJ...626..844G. doi:10.1086/430250. ↑ Famaey, B.; et al. (2005). "Local kinematics of K and M giants from Coravel, Hipparcos, and Tycho-2 data. Revisiting the concept of superclusters". Astronomy & Astrophysics. 430 (1): 165–186. arXiv:astro-ph/0409579 . Bibcode:2005A&A...430..165F. doi:10.1051/0004-6361:20041272. ↑ Vondrák, J.; Stefka, V. (2007). "Combined astrometric catalogue EOC--3. An improved reference frame for long-term Earth rotation studies". Astronomy & Astrophysics. 463: 783–788. Bibcode:2007A&A...463..783V. doi:10.1051/0004-6361:20065846. ↑ Makarov, V.V. ; Murphy, D.W. (2007). "The local stellar velocity field via vector spherical harmonics". Astronomical Journal. 134 (1): 367–375. arXiv:0705.3267 . Bibcode:2007AJ....134..367M. doi:10.1086/518242. ↑ "Search for Sun's Sibling Could Find Life's Cousin : Discovery News". News.discovery.com. 2012-04-09. Retrieved 2012-08-17. ↑ Van Leeuwen, F. (1999). "Hipparcos distance calibrations for 9 open clusters". Astronomy & Astrophysics. 341: L71–L74. Bibcode:1999A&A...341L..71V. ↑ Pinsonneault, M.H. ; et al. (1998). "The problem of Hipparcos distances to open clusters. I. Constraints from multicolour main-sequence fitting". Astrophysical Journal. 504 (1): 170–191. arXiv:astro-ph/9803233 . Bibcode:1998ApJ...504..170P. doi:10.1086/306077. ↑ Pan, X.P. ; et al. (2004). "A distance of 133-137pc to the Pleiades star cluster". Nature. 427 (6972): 326–328. Bibcode:2004Natur.427..326P. doi:10.1038/nature02296. PMID 14737161. ↑ Percival, S.M. ; et al. (2005). "The distance to the Pleiades. Main sequence fitting in the near infrared". Astronomy & Astrophysics. 429 (3): 887–894. arXiv:astro-ph/0409362 . Bibcode:2005A&A...429..887P. doi:10.1051/0004-6361:20041694. ↑ Soderblom, D.R. ; et al. (2005). "Confirmation of errors in Hipparcos parallaxes from Hubble Space Telescope FGS astrometry of the Pleiades". Astronomical Journal. 129 (3): 1616–1624. arXiv:astro-ph/0412093 . Bibcode:2005AJ....129.1616S. doi:10.1086/427860. ↑ Charles Francis; Erik Anderson (2012). "XHIP-II: Clusters and associations". arXiv:1203.4945 [astro-ph.GA]. ↑ Melis, C; et al. (2014). "A VLBI resolution of the Pleiades distance controversy". Science. 345: 1029–1032. arXiv:1408.6544 . Bibcode:2014Sci...345.1029M. doi:10.1126/science.1256101.